With the home advantage and the excitement of the first game of the season Peterhead were determined to have a great start to the season. The first 10 minutes of the game saw Captain Laura Cook give Peterhead an early lead with a try after some great work from the team, this was converted by Isla Jack which gave Peterhead a real buzz. They quickly followed up with another try from Isla Jack who was unlucky not to convert. Despite some wonderful defensive work and great tackles Huntly replied with a try but missed the conversion. Peterhead didn’t let this put them off and after the restart were raring to go with Addy Johnson showing great rucking skills. A dominant scrum and some very strong carries from the forward pack, particularly Lynne Greig, meant that Peterhead were soon awarded with another try from Lynsey Hester. Just before half time a run from winger Tracey Shepherd resulted in another try as she managed to get the ball over the line after a successful break. After half time Peterhead had another try this time courtesy of flanker Nicola Hall who made the most of some great handling from the backs, passing the ball through the hands of the team with a lot of hard carrying from the Peterhead forwards pack. Huntly returned with a further try after taking advantage of a few missed tackles by Peterhead, however the home side were quick to respond with another try from Isla Jack. 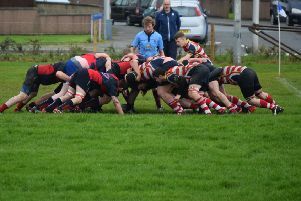 Due to injury Peterhead were soon down to 14, but that didn’t stop them and, after some hard rucking and good line breaks, there was a second try for Cook. With just minutes to go Huntly managed to break the Peterhead line for a final try.